Mixed-income housing, either in one building or in a district or neighborhood, offers many social advantages and almost no disadvantages. That's because mixed-income neighborhoods strengthen our social networks and therefore expand what might be called the social capital that your town has to work with. Many suburbs are homogeneous in socioeconomic level simply because the housing stock was developed in the same era and similarly priced at the time. Then as new households buy or rent homes, the subtle social cues keep people within their own income group. But consider the following benefits of a municipal or county policy to promote mixed-income housing. Lower income people tend to escape from poverty and improve their productivity to society faster when they land in a higher income neighborhood. This is true because of better role models and better social networks, which help most of us get jobs. Of course living among some higher income people also might allow some low-income people who are best suited to becoming entrepreneurs to pursue opportunities of that type. For more detail on the improved outcomes for low-income people who migrated in small numbers to higher-income areas from the Gautreaux public housing in Chicago, as opposed to staying in low-income neighborhoods, see our housing affordability page. Here's an odd fact: Many low-income people in their early 20's tend to become middle income and high income folks later in life! Who are the people who bring vitality to our streets by adopting new trends sooner than the rest of us, worrying about style and styling, generally acting slightly or mostly outside over-prescribed social roles, and bringing idealism and enthusiasm to many different projects and ventures? That would be the young people. If you price them out of your market, you've lost a significant source of innovation. The mix of ages will enhance the possibility that you can attract some of the creative class to your little corner of the world. Middle income families and households are able to diversify their acquaintance base and thereby gain some of the benefits of getting acquainted with higher-income people to learn how they did it, as well as to observe the cautionary tales of how lower-income people came to be in their less versatile low-income situations. If the mixed-income strategy becomes intentional and also a part of civic dialogue and consciousness, there's some hope that some of the detrimental aspects of "keeping up with the Joneses" might be mitigated. When you live among people of lower income, there's a tendency to appreciate how fortunate you are much more. And an appreciation of the fact that it's the public spaces that make you really rich or really poor might develop. A variety of shared facilities, access to nature, and a sense of community are the true wealth that's worth worrying about, rather than tennis shoes or logos on handbags. Higher income people also benefit from living in a mixed-income housing situation. And I hope that many of them will recognize the benefits to the soul of doing so. It's tempting, I know, to barricade oneself off from the rest of society in an attempt to find safety and avoid some of the more disturbing images of the underclass. But don't do it, if you're a high net worth individual. By only associating with others who have figured out the money piece, you lose touch with the common lot of humanity, at least in your own nation. In becoming a wealthy person cowering in a gated community, you lose the opportunity to be of service in a democratic society, to model how restrained and noble wealth really can be, and to gain a greater appreciation of your blessings. Yes, we're saying that life will be more rewarding if you choose a mixed-income housing community than if you seclude yourselves with others who also are in the highest tax bracket. For another perspective, take a look at a recent addition to this website about the Yes, In My Back Yard movement attempting to establish itself in the U.S. Many naturally occurring mixed-income housing neighborhoods already exist. Nearly every small town and most small cities exhibit this phenomenon. In newer developments, such as the one shown in the photo on this page, a skillful architect can draw a good mix of larger and more modest homes. Many new urbanist communities come close to the mark. A few neighborhoods in large cities have mastered the art, but often what people call mixed-income communities actually consist of a mapped district where incomes are still similar within a block. Actually high-rise multi-family buildings in cities offer a relatively abundant source of potential mixed-income housing. Different sizes of units within the building are easily camouflaged. The "big house" model is vitally important to creating mixed-income housing that will be accepted by the community. What I call a "big house" in quotation marks is the multi-family dwelling that is architecturally nearly identical to a mansion. In reality, it could be two, three, or four housing units. There could be an alley house, carriage house, granny flat, mother-in-law unit, or whatever you want to call it on the rear of the property, offering one more accessory dwelling unit. So if your architecture is well controlled, and you have a clever person doing the controlling, a four-family with a granny flat, a one-family that is a second residence for a person of huge wealth, a single-family that is large but has to accommodate a large family who needs a rental property in back to be able to keep up the payments, and a three-family that consists of two smaller units downstairs and a large owner-occupant unit upstairs can be side by side by side on a block. With even more work than is evident in the new urbanist communities, existing neighborhoods can be retrofitted to allow more of this type of mixed-income housing. Many cities are well equipped for the mix, especially when renovation of upper level stories in a downtown or densely developed business area is considered. In a more suburban example, ranch or tract houses of a certain age might actually be able to be combined into two or more units by connecting them with a new addition. In this event, the lots are combined through a process that most cities already have on their books in the form of subdivision regulation. Then the logistics of dealing with different ground elevations and so forth are worked out, and the new addition expands both homes. The resulting two-houses-turned-into-a-building then becomes a single-family residence for a more wealthy family, or it becomes a two-family allowing both households more space. If you do this along an entire block face, no one needs to know which two-house combinations now house one family, two units, or even three households. Check out the suburban retrofit idea if this sounds interesting. In new developments, a government actually can virtually require a mix of incomes by specifying a minimum amount of affordable housing and by providing incentive zoning for its development. If you want to "require" higher income people to live with the rest of us, that's a little harder. 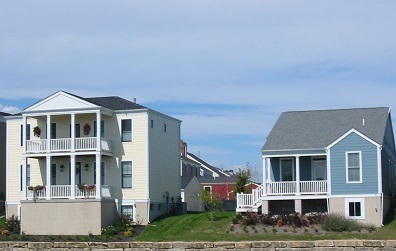 However, you can do it through subdivision regulation policies that prohibit really large lots, prohibiting gated communities, perhaps prohibiting golf course communities and other planned developments that emphasize high-end amenities, and limiting the size of single-family homes in planned developments unless a particular percentage of smaller square footage housing units also are provided. Requirements for a large amount of public space also encourage a mix of incomes by making smaller houses or apartments more marketable. These are just starting points. Begin by talking about and convincing others of the societal benefits of creating mixed-income housing neighborhoods and new communities, if you live in a region that is growing. Let's talk just a little more about social capital. When a community increases its social capital, it means increasing the acquaintanceship among networks of social networks. Most people in the business community have grasped to some extent the power of networking. The concept of social capital is that different networks will benefit by having people who connect across the networks. And you can escalate those social benefits in a huge way if you think about how to provide mixed-income housing in your town. For civic life to work, in some sense the entire political jurisdiction must become one big network. I'm convinced that community poverty as an issue will never be resolved, even though we have the means to do so, UNLESS we explain clearly how higher income and middle income associates are essential for many people to raise themselves out of poverty. They need successful acquaintances. If we understand that key point, then hopefully some of us will be willing to interact with people who are not yet as successful as we are. Note that if only one neighborhood in a metropolitan area is willing to participate in mixing incomes, it won't help much. Many or most neighborhoods have to be willing to accept a few low income households, who then will be able in some instances to move themselves out of poverty. Even if finances remain marginal, they will move themselves out of the permanent underclass mentality that breeds crime, depression, lethargy, civic apathy, and dull eyes. The benefit of mixed-income housing is that the lowest income earners may move into greater stability and prosperity. In a nation and world desperately in need of productivity increases to lift us from frequent threats of recession, this is really important, friends.